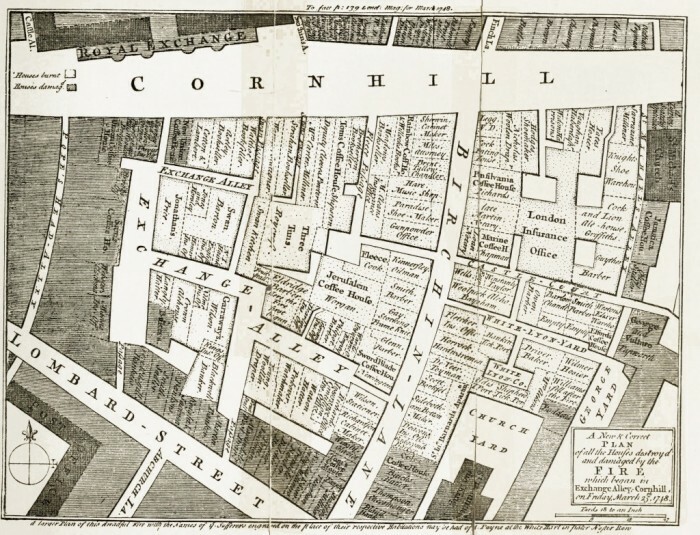 Drafting the map involved many hours of research, my head down in books and maps. Many hours in front of a dimly shining screen. I managed to get through approximately 75 mugs of coffee (mostly instant) and explored history, politics, popular culture and coffee cup design. I had always promised myself that, one day, I would actually visit this part of London and physically explore it. 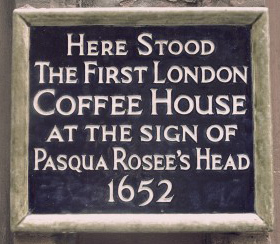 The tour began with a shot of hot hot coffee, brewed to a 17th century recipe. Health and Safety required that spit and soot were left out but the English mustard was very much in evidence, giving the brew a strong bitter edge and gloopy consistency. It would be dishonest not to confess that most of it was poured down a convenient 21st century drain. 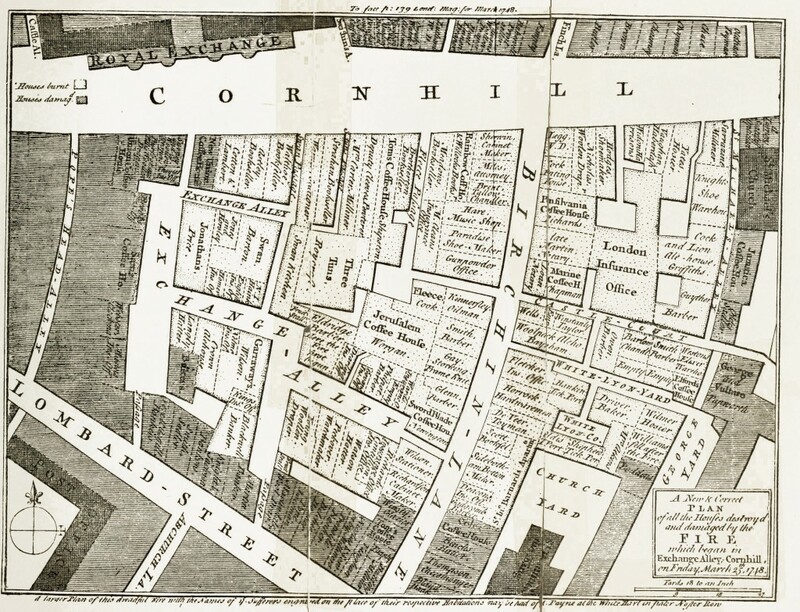 Away from the elegance of Cornhill, we branched off into the close, grimy alleys, so familiar from my map, to hear stories of the mysteriously exotic Pasqua Rosee, the first coffeehouse entrepreneur. 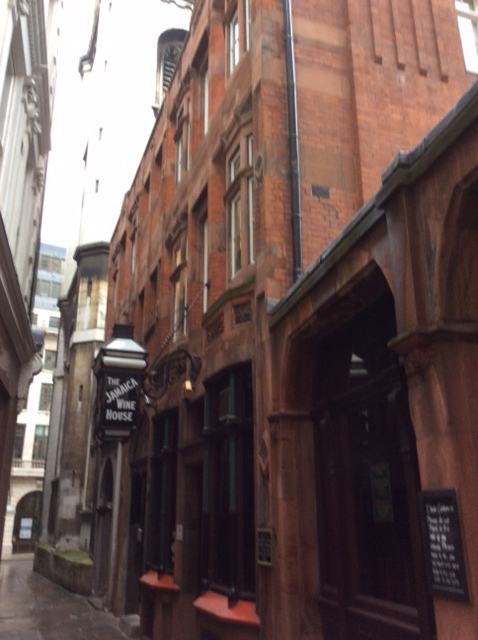 Jamaica Inn, the site of the first coffeehouse in London. A shaky photograph after a strong shot of 17th century style coffee. 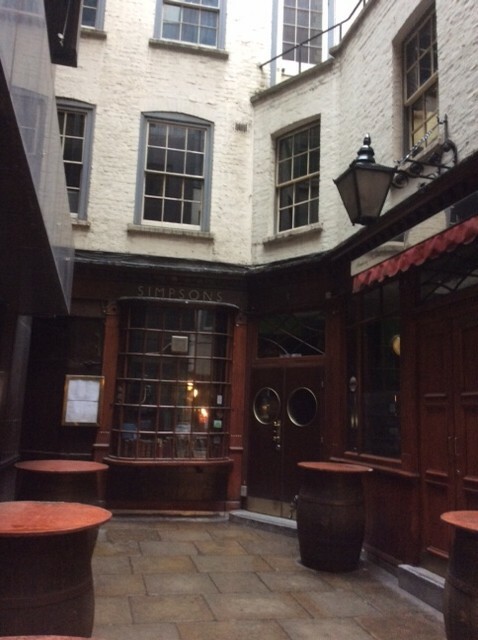 This image of Simpson’s Tavern, the oldest chop house in London, gives an idea of the courtyards and alleys of the area. 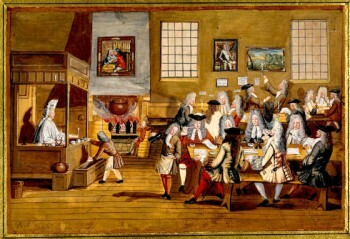 The story of coffeehouses was clearly one of burgeoning capitalism and, as Matthew Green pointed out, could, perhaps, be seen as the birthplace of the Age of Enlightenment and the modern world. Caffeine fuelled conversations of philosophy, medicine, mathematics and science took place over rough, wooden tables in the smoky, steamy atmosphere. News was leapt upon greedily and spread, regardless of its veracity – a 17th century internet of information and misinformation. The tour ended, fittingly for a story seeded in hard nosed money-making, outside a Starbucks. A new coffee revolution was called for – to spend time in coffee shops having conversations with strangers, instead of staring silently into our phone screens. 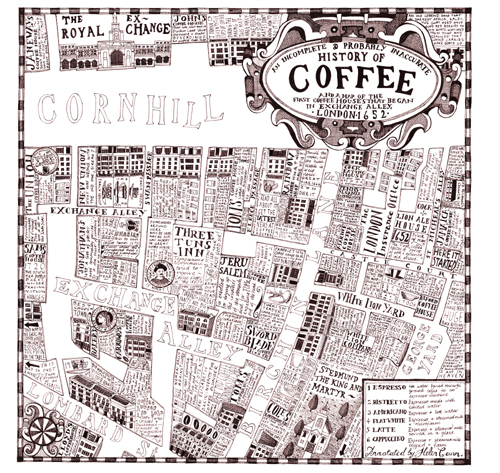 To look into our neighbour’s eyes, smell the coffee on his breathe and, as in the coffeehouses of the 1650s, physically experience information sharing. Walking the area of Change Alley, once known as Exchange Alley, really brought my coffee and cartography research to life. I wonder how I would have approached the map if I’d visited the place first. 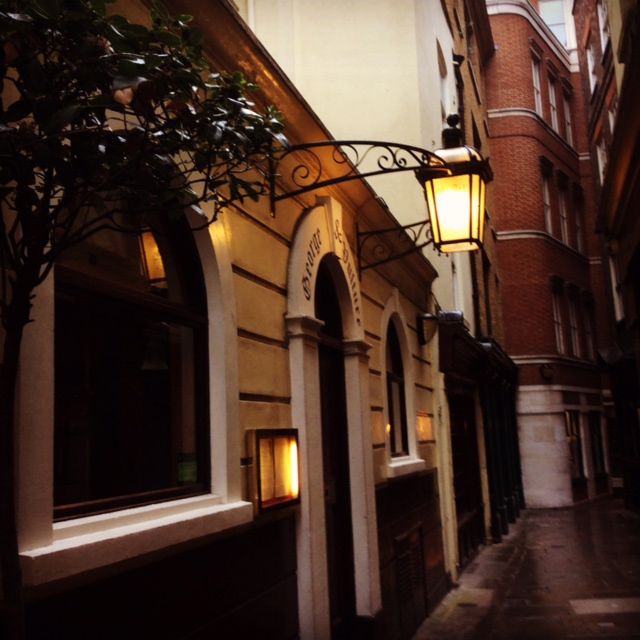 So much was visceral – yellow lamplight still warming up claustrophobic corners, shop signs creaking in the wind, the edge of an unexpected encounter with a stranger in the labyrinthine streets. Perhaps I should make a note to myself too, to try and ‘feel’ a place physically and emotionally before beginning any map work and remember that there is so much more to a place than simple information. The rain started to become heavier by the end of the tour and the crowd slowly dispersed into the greyness. Probably all searching for a cup of hot coffee. Without mustard.